This is a detail photo from a friend’s guest room. I stayed there a few weeks ago, when I was visiting Austin and looking for a place to live. I couldn’t help but notice how these seemingly simple smudges of paint effectively convey the idea of roses. You can see a (rather poor) photo of the entire painting in my Flickr photostream here. Flowers were a design theme in fashion this Spring . . . here is one example from design Olesia Makhonko, which I noticed on Outi’s Outsapop blog last summer. Follow the link above to Outi’s blog post for more examples of roses made from leather, ribbon and fabric and links to tutorials for making 2-D and 3-D roses from fabric. Of course, roses as a design motif appear in both antique and modern quilts. 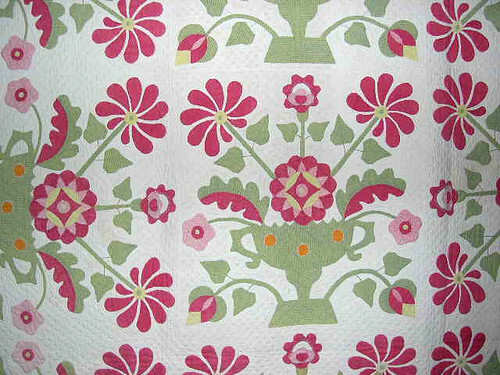 This is a detail photo from Susan McCord’s Harrison Rose Urn quilt, made circa 1860. I like how she represents the rose from bud to full blown flower. I wasn’t able to photograph the entire quilt, which has a different style vine appliqued on each of the borders, but you can see more of Susan’s quilts and some other incredible quilts from the Henry Ford Museum’s collection in my Quilt Genius photo set. Fast forward to modern times and you’ll find a lot of examples of roses that look a lot like ours . . . though not necessarily constructed of square blocks. Sarah shared this photo of her quilt, made as part of a Quilt-A-Long. Her quilt has 30 roses and was a gift for her sister for her 30th birthday. You can see that these roses were constructed in a similar log cabin-fashion, but were left “round” and appliquéd to a pieced background. 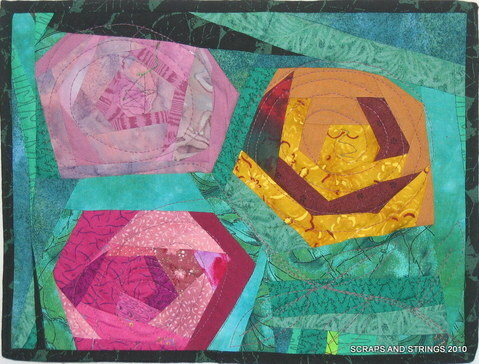 You can see more quilts from the Little Bouquet QAL in their group pool on Flickr. In this little quilt, A Rose is a Rose, made for the Alzheimer’s Art Quilt Initiative by Brenda Suderman of Winnipeg, Manitoba Canada, the roses are pieced together in a liberated fashion. This little quilt (8 3/4 by 11 inches) earned $40 for AAQI. You can read her artist statement on the quilt’s page on the AAQI site. Check out more of Brenda’s creative quilting and read what she has to say about this quilt on her blog, Scraps and Strings. Here’s one last abstracted rose design, Ann Fahl’s Spiral Rose Garden. I have been in love with this concept since I took a beading workshop with Ann a few years ago and got to see some examples of her quilting and bead embellishment up close. These spiral roses are fused, raw edge appliqué. Visit the gallery page on AnnFahl.com for this quilt for detail photos of quilting . 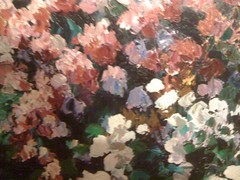 . . and while you’re there, be sure to click around the gallery to check out some of her other rose quilts. While these roses are quite different from those we are making, this quilt is another example of how beautiful many different colored roses can be.